We might as well close this category down. Gary Oldman will definitely win Best Actor Oscar for his stirring portrayal of Winston Churchill in Joe Wright’s new biopic drama “The Darkest Hour.” America’s going through its own Darkest Hour right now and we really need the inspiration, and hope, that this great film displays. One of the best of the year, by any stretch of the imagination, filmmaker Joe Wright has directed it like a champ. I’ve always been an admirer of his since “Atonement” and his controversial “Anna Karenina”. “Darkest Hour” is kind of non-traditional choice for this wild young talent, but he aces it. Keeping his camera, and us, focused on the ground-shaking, soul-shattering performance of British actor Gary Oldman as Winston Churchill. 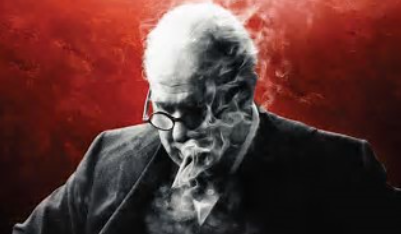 Oldman has always been considered one of Britain’s finest actors, but here he reaches his absolute zenith as the garrulous, cigar chomping hero of WWII, Prime Minister Winston Churchill. Oldman is so convincing you feel like you are witnessing the real man in an all-color documentary. But it’s acting, my friends, great acting, and we rarely see great, bombastic, almost theatrical performances of this kind on film anymore. His Churchill is almost is too big for the screen. But just the right size for Oscar. And all the awards Oldman is sure to reap as we reach the end of the year and Awards season, which is upon us, NOW. Wily director Wright’s always moving camera manages to capture Oldman’s close-up portrait to a fare-thee-well. At the Q&A after the film Wright was actually there himself. Wright told us Gary Oldman( see above ^) spent four hours in the make-up chair every morning getting into the massive Churchill’s face, and an hour at night to take it off! It’s amazing he had any skin left! When asked why there were so few exterior scenes, Wright said he wanted to keep the focus relentlessly on Churchill. And he does. His Winston is always playing to the galleries, realizing all he has is his words and his great voice to rouse a nation. I get chills just thinking about it. 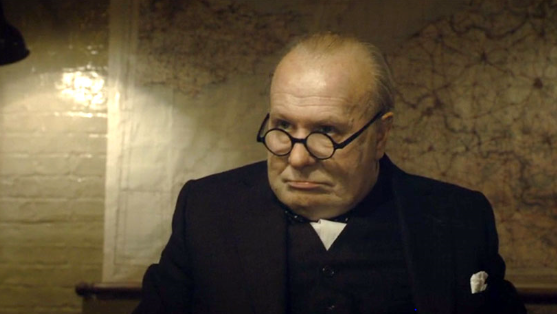 You come out of “Darkest Hour” wishing Oldman’s Churchill was our president NOW. We really need him. And you really need to see “Darkest Hour” to remind you of how great statesmen really behave facing war. We see Winston warts and all, as he combines bacon, eggs and whiskey for breakfast, then continues drinking throughout the grueling day. He stomps about in his boxer shorts and open robe in front of his embarrassed British Rose of a secretary, played by Lily Rose of “Downtown Abbey,” who is really a stand-in for the audience here as she and Churchill are confined in close-quarters, often underground, all through the film. Dunkirk and what they are trying to do is a map on the wall with dots on it and tiny pins representing thousands and thousands of British soldiers. Their whole army, really. King George V, with his famous speech impediment (See “The King’s Speech”) is done very well here by Ben Mendolsohn, who has to be slowly talked into the war by Churchill. In “Darkest Hour”, we see, as unbelievable as it sounds today, many, many proponents of a peace of appeasing Hitler. Ronald Pickup as Neville Chamberlin and Steven Dillane as the vulpine Count Fairfax are the appropriately oily villains. They try to block Churchill’s crusade to a righteous war with Hitler at every turn. And this is all true. “The Darkest Hour” is very, very dramatic at every step. The safety of the entire world and all our futures are in his hands. When Churchill finally gets to his resounding “We will fight on the Beaches!” speech, the audience nearly leapt to its feet in agreement. The applause that was in the theater, will be heard down centuries, and will continue all the way to the Dolby pavilion in March on Oscar night.